In the wake of the the herdsmen strike, the vast majority of people living in Agatu live in fear of further attacks. As such, anyone, most especially a stranger, would be seen as a spy sent by Fulani herdsmen to glean information. It’s normal. When I visited Ndiagu, Attakwu, Enugu, some residents I spoke with said the same thing, they told me how a Hausa man clothed in army uniform came under the guise of protecting them to get information (to know whether they would revenge, after the invasion). “You cannot even trust your Igbo brother,” one Chibuzor told me after he accused me of being a spy. Back in Agatu, that is exactly as I was seen, even as we zipped along the straight dusty road that connects the five affected communities. Suspicious glares welcomed us. 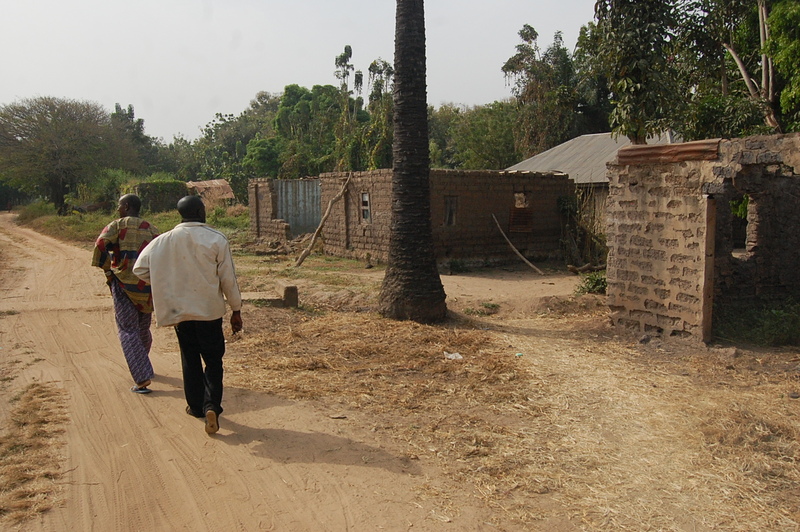 As we approached Aila, the last community before Okokolo, the worst happened again. Suddenly we alighted from the bike. Unconvinced, perhaps and in a bid to follow due process—before I would start interviewing people and taking shots, my fixer and the motorcyclist had discussed this in Idoma language: We must take him to the shrine, for scrutiny, to follow due process. In some communities, before you can proceed on any interview or work as a journalist, you need to meet the elders or traditional rulers of the community, to inform them about your mission, to pay homage and to get approval. Agatu’s case is different. The person to meet for approval or scrutiny here is a native doctor or medicine man, the ebaliba 1 of Agatu. Once he approves of me, I am good to go. As a Christian I’ve never entered a shrine before but before I could start any work, I was told to enter the shrine for scrutiny—to be sure I was not a spy. “If we don’t do it this way, we’ll get ourselves into trouble,” my fixer, Onyilokwu said, firmly. We entered the shrine, a strange room with horns and animal feathers fixed on the wall made of mud. We sat on a wooden chair, barefooted. The medicine man then asked for my name, I told him. For about 5 minutes he was speaking to a dry chicken femur (tapper) as though speaking with a microphone. Afterwards, he turned to his large beaded divination apparatus—hitting them with the dry femur he had spoken to, mumbling incantations to summon the attention of the spiritual forces behind the divination system. Silence plunged the shrine; everyone was waiting for the native doctor’s verdict, expectant, perhaps. “He’s not a spy, his heart is clean,” the native doctor declared in Idoma, beaming slightly. Had the oracle said the otherwise, what would happen? “Then, you’re dead,” Adehi, the motorcyclist who took us to Agatu said. “They won’t allow you go with us,”Onyilokwu adds, explaining the consequences of the oracle saying the otherwise: The spy must be punished. Punishment here means jungle justice in a place with no police station. The angry youths and family who had lost their loved ones would pounce on me, they will batter me, perhaps. 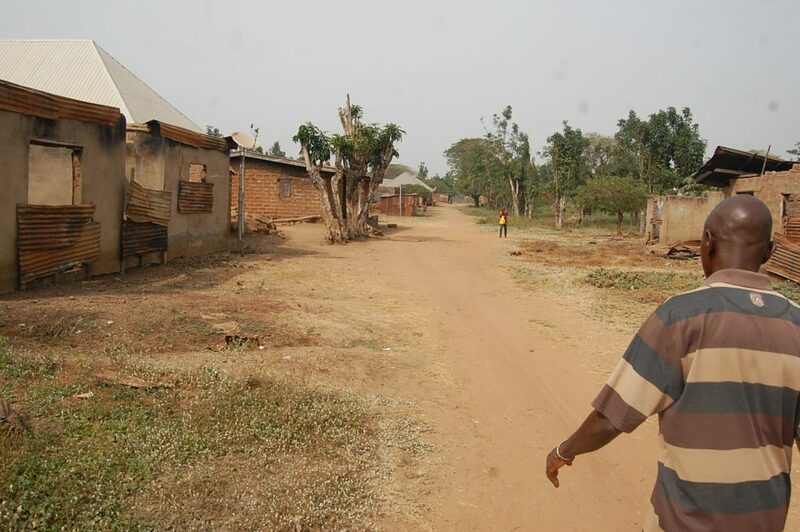 Okokolo, Agatu: Still a ghost town. Unnerving silence enveloped the atmosphere as we entered Okokolo—the worst hit village where more than 125 people were killed by suspected Fulani herdsmen when they struck in February. Unlike other villages, there was no one to welcome us with a glare. I saw, at the very most, 10 people as we toured the village. The destruction was even more clear to witness – the burnt houses woven together, the carcass of burnt motorcycles and electronic appliances now a tableau of destruction. Even the once lively small market, where staples such as yam and rice were sold, remains empty after 9 months when the herdsmen struck. 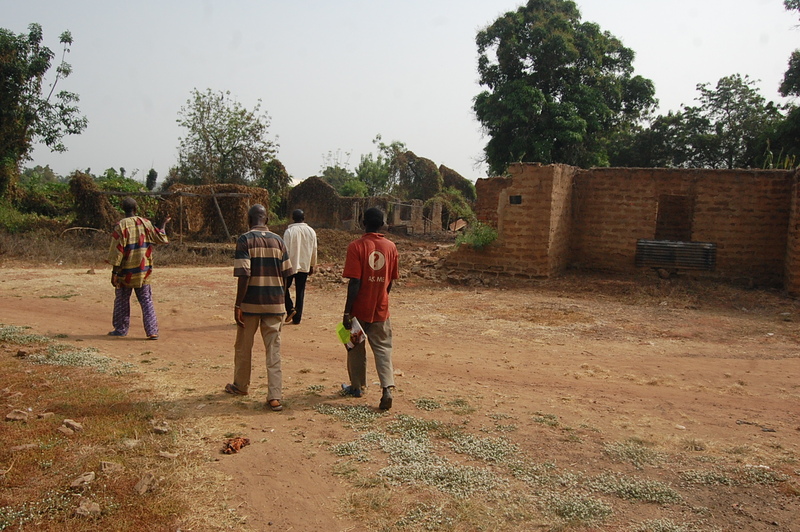 Other neighboring villages like Aila, Obaraji have already sparked into life, recovering from the attack but Okokolo was still bathed in silence; still empty with few people still living there as the vast majority of villagers had fled. The chairman of the community, Anthony Peter said they had left to neighboring towns including Ugbokpo, after the attack and fear of another attack has kept them away. 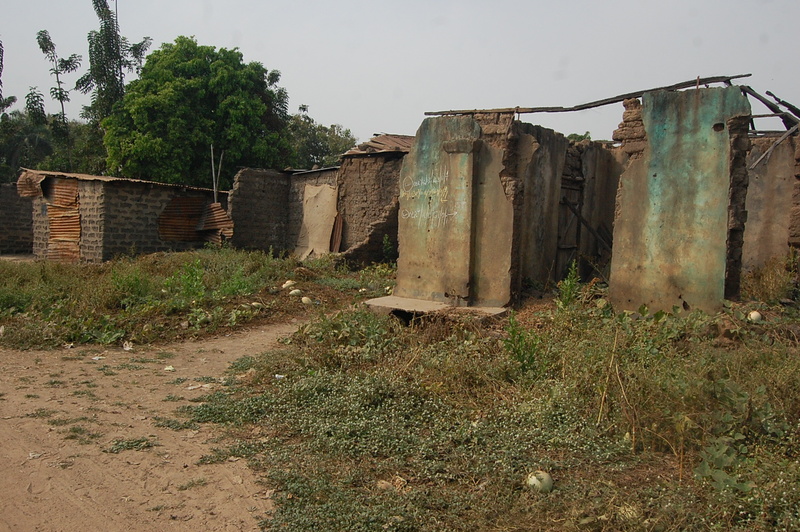 “Some don’t have the money to rebuild their houses destroyed during the attack,” he told YNaija. To erect a house, even a mud house is quite expensive, Peter said, adding that his two houses were burnt. From Boko Haram’s 7-year insurgency fight towards establishing an Islamic state in northeast Nigeria, to the pro-Biafra secessionist protest in the southeast, and the Niger-Delta Avenger, a new militant group blowing up oil pipelines in Nigeria’s oil rich southern region—Nigeria has been enclosed in a web of violence and riot in the last 16 years. But the silent farmer-herdsmen communal clashes have not been given needed attention, slipping under the radar, the result of little to no media coverage. According to analysts, this conflict is as old as Nigeria’s 16 year-old return to full democracy. The conflict has blighted developments in agrarian communities in Nigeria’s north-central states. Nigeria is composed of 6 geo-political zones and a slice out of the six—north central Nigeria, also known as middle-belts states have been exposed to a wave of conflicts in connection with the communal clashes between dominant Christian farmers from the south and Fulani herdsmen, Muslims from northeastern Nigeria. Benue is not the only state in north central Nigeria witnessing farmer-pastoralist related crisis. Other north central states like Kaduna, Plateau, Nasarawa are also experiencing the conflict. According to a series of reports published in July 2015 by global humanitarian agency, Mercy Corps, Nigeria stands to gain up to $13.7 billion annually in total macroeconomics progress if the crisis was reduced to zero percent in affected states of Benue, Kaduna, Nasarawa and Plateau. Since 2009, Boko Haram has killed more than 10,000 people in north east Nigeria, but in north central states research shows that the pastoralist-farmer conflicts have claimed the lives of more than 50,000 people since 2001. In Jos alone, the capital city of Plateau state, September 2001 riots between nomadic herdsmen and farmers resulted in the deaths of about 1,000 people in a week. After the massacre, Nigeria government led by then president Olusegun Obasanjo, set up an investigative committee to look into the incident. They found out that between September 2001 and May 2004, more than 53,787 individuals were killed due to various farmer-herders crises. Other states including Kaduna and Nasarawa have also been drowned in pastoralist-farmer related attacks. In Lafia, Nasarawa, a 27-year-old businessman told me it’s the bloodiest attack that has ever hit communities in Nasarawa, causing a sharp decline in macroeconomic progress. Although the crisis had taken its toll on socioeconomic activities in Okokolo, Agatu, the most important thing, Peter says, is rebuilding Okokolo, mainly erecting new houses. Peter, also a graduate of the University of Nigeria, Nsukka pointed to the Maslow hierarchy of need to underscore his point about the dire situation in Okokolo. “One of the basic Maslow hierarchy of need is shelter, but where’s the shelter (in Okokolo)?” Peter asked.